They are watching. Are you? In early 2013, visitors to Alki beach in Seattle were surprised by a new neighbor. It was in the public park across the street where many people enjoy sunset views of Puget Sound. There, the city installed a network of wireless cameras to give it 24-hour access to a video feed that covered the Port of Seattle, the beach, the park, the street, and nearby residents’ homes. The $5 million network was capable of recording activities in so many places due to its almost 360-degree pan and zoom capabilities, which police officers and other public officials could manipulate remotely in real time. Encouraged by millions of dollars in federal grants, local law enforcement agencies across the country are acquiring surveillance technologies at an alarmingly rapid rate. As more and more invasive technologies are created for the military and intelligence agencies, they trickle down to our increasingly militarized police forces. Often, local lawmakers and the public are not familiar with these systems and their dangers to civil liberties, and so public policy in response to surveillance lags behind. New surveillance technologies and the problems associated with them are complex and have a cost to our privacy and security, as well as to public budgets. Federal grants to local police departments come with strings attached: data sharing agreements, joint missions, and a shift from local priorities to federal ones. Without privacy protections, clearly defined operating procedures, enforcement provisions, and audits, communities should rightly fear that government will use these systems in ways that infringe upon their civil liberties, now or in the future. 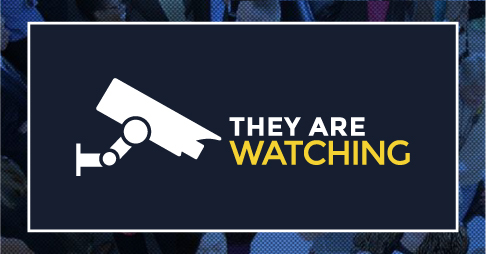 To help communities and lawmakers who represent them make more informed decisions about the adoption of surveillance technology, the ACLU of Washington has launched a new website, “They Are Watching.” It provides information on many commonly acquired systems and the civil liberties concerns they present. It also offers a series of recommendations to help communities question the need for such equipment and to craft policies and procedures that protect civil liberties. Finally, it provides a downloadable model ordinance designed to ensure that the public has a chance to evaluate proposals for new systems before they are acquired and that policies for their use to protect civil liberties are put in place. After intense outcry from community activists and organizations including the ACLU, the Seattle Police Department deactivated the camera network in Alki. Police pledged to keep the cameras turned off until the city council approves a set of operating policies and privacy protections. Furthermore, the city adopted an ordinance that requires council approval before the police department acquires or alters the use of surveillance systems. While the ordinance is weaker than we would like, their efforts are a step in the right direction. But there is much more work to be done at the federal, state, and local levels to assure that communities are not surprised by the arrival of new invasive technologies and their impacts on civil liberties. Communities should not have to fight for privacy protections after surveillance systems are installed. We hope that our new website will provide communities and policy-makers with the information they need to consider the merits of these technologies and, if they choose to deploy them, to create policies necessary to protect civil liberties. Check it out.